Can you teach a girl to reload? I’m not sure what ballistic technician Duane Siercks did to anger our boss, but a few weeks ago he was assigned the job of teaching three of us women in Sierra’s front office to reload. Duane has been reloading for over 35 years and has two daughters that he has taught to shoot, so he bravely and enthusiastically accepted the challenge. We were told to meet him in Sierra’s underground range at 3 p.m.
With the Sierra Bullets 5th Edition Reloading Manual, eye and ear protection, zero previous experience, and lots and lots of questions in tow, Billing Clerk Tanya Byler, and Sales Manger Betty Howard, and I headed to Sierra’s underground range for Duane’s Reloading 101 class. Step One: We each picked out ten .223 cases and carefully inspected them. 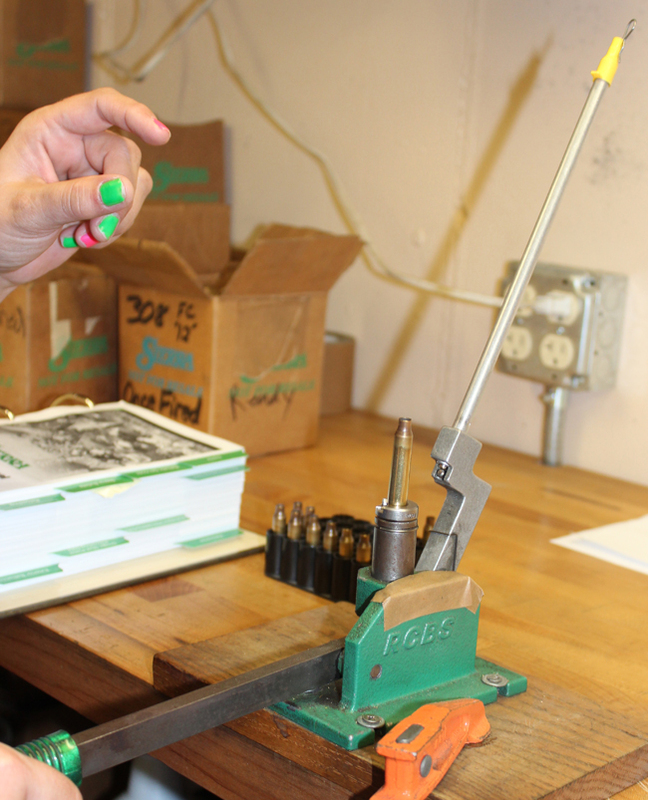 Step Five: Once we had the cases all ready to go, we looked up the load data information in Sierra’s 5th Edition Reloading Manual. Step Six: We added powder to each case with the Redding powder measure and inspected them to make sure they all visibly had the same amount of powder. Step Eight: Have fun shooting your reloads! We shot a piece of paper down range at 200 yards. 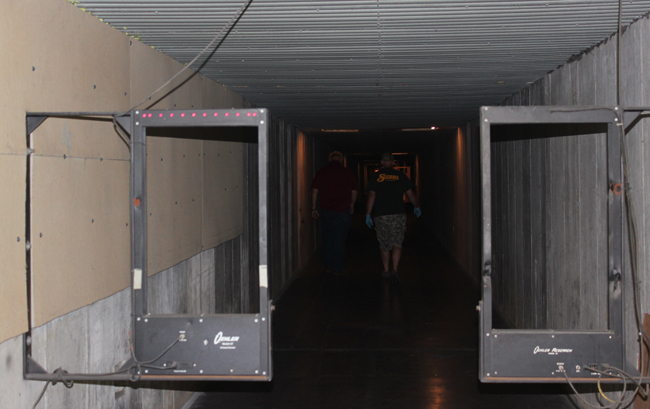 Step Nine: Send Duane (or whoever you happen to have handy) down range to retrieve your target. Then use calipers to measure your group size. 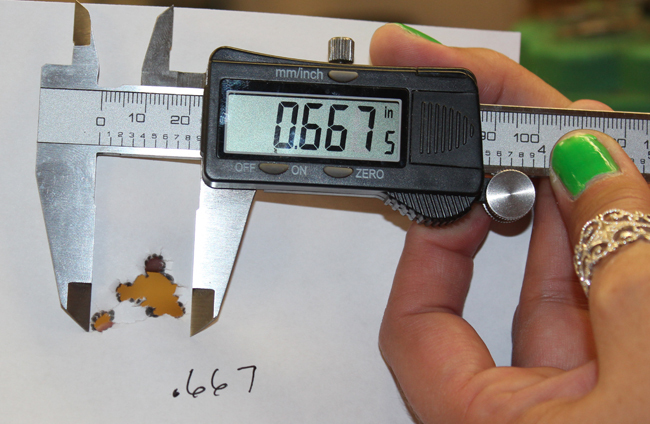 This is done by measuring across the widest part of the group and subtracting the width of the bullet. Step Ten: Start the whole process over again! 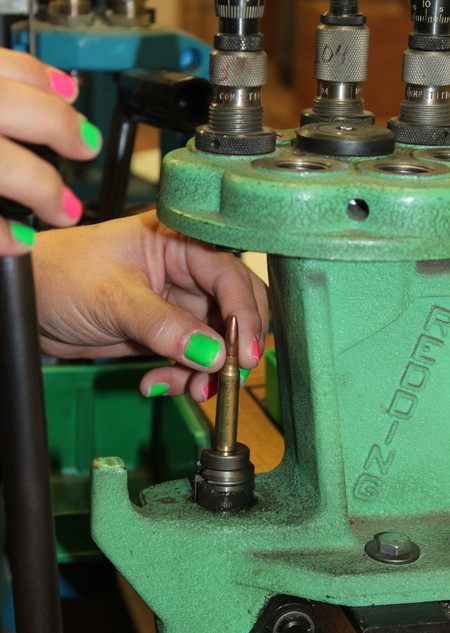 Reloading equipment can look a bit intimidating and even dangerous. 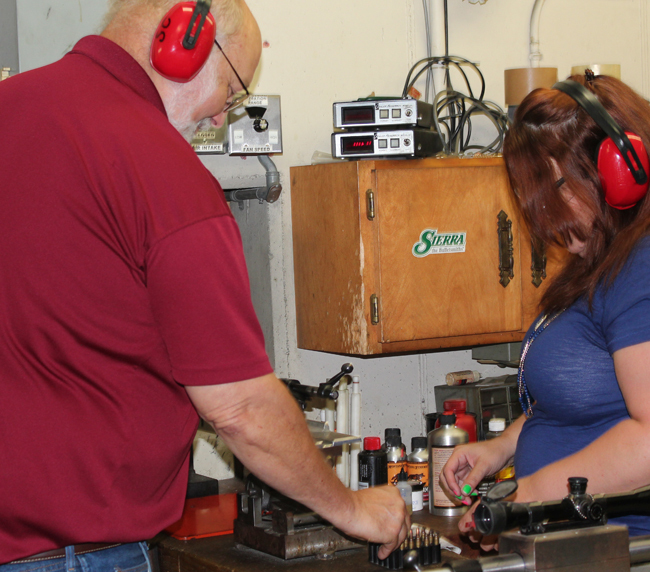 If you are looking to learn more about reloading, I would recommend you work with someone who is familiar with the processes to get you started. 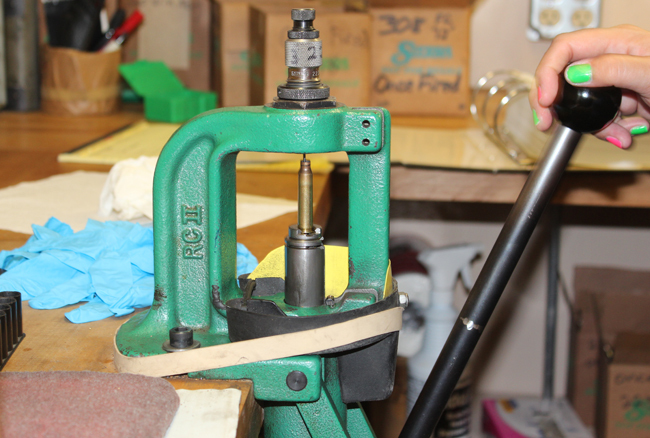 Duane set up the reloading equipment appropriately for us and supervised that all of the steps were done safely. Don’t be afraid to ask lots of questions. Trust me, it’s not as overwhelming as it looks. If you can use the equipment in your kitchen (or even if, like me, you aren’t the greatest cook) you can learn to reload. And if you can reload, you can spend more time at the range and having fun with other shooting enthusiasts. The three of us girls (not sure if Duane is ready again yet or not) are already excited about our next adventures at the reloading bench and the range! 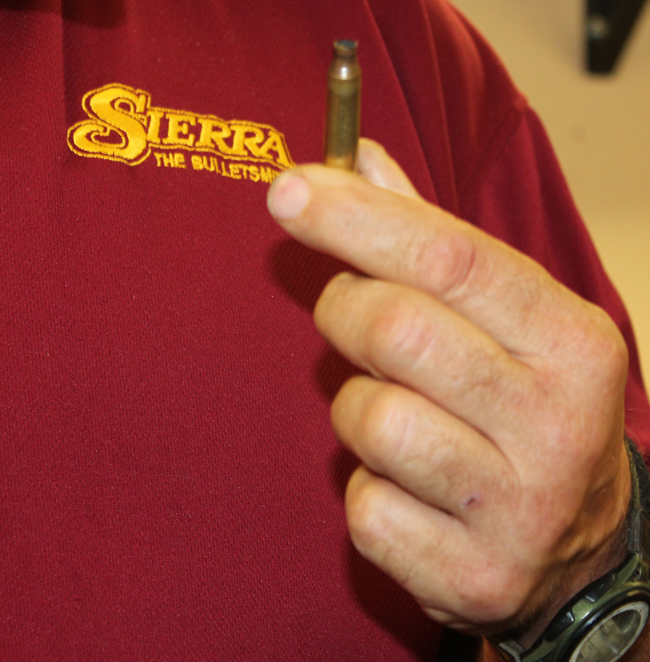 If you have any questions about getting started reloading or Sierra bullets please call our technical support team at 800-223-8799 or email us at sierra@sierrabullets.com. 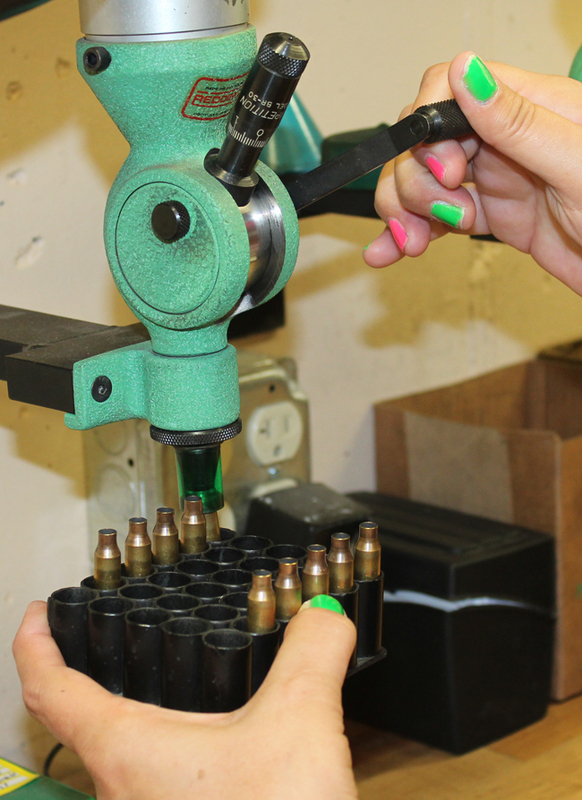 This entry was posted in Reloading and tagged beginning reloading, how to reload, reloading, reloading ammunition, reloading class. Bookmark the permalink. Well I think with more simple articles, based on people others are able to identify with, that may happen. What I found refreshing was the number of pictures, the simple layout, and taking 3 inexperienced people from start to a firing and measured completion of the reloaded rounds! What I see is every aspect being carefully covered, mentored guidance and accurate ammunition being the result by people with no foreknowledge of reloading! To me one of the best ways to have more people become interested!! Very cool Congrates ladies. But how about the question ; How do you get your wife interrested in wanting to reload? She shoots about once a year and I would really like to see her shoot more and learn to reload. She enjoys shooting but just never wants to do it. Give her a purpose for reloading. So look around to the various shooting sports, one of them might hold your answer. Great Post, I am really happy to read such this kind of post. This post really clear that, reloading is not only for male girls also can reload there own ammo. Not only male-female also can do this great. thank you for your information in this post.